Rich Dad's Prophecy answers the question on every working person's mind: "Will I ever be able to retire?" Be forewarned. With the recent volatility of the stock market and the upheavals in corporate America, millions of workers are watching their life savings melt away in front of their eyes. 401(k) plans are no longer a guaranteed fast track to a secure retirement, but what are the alternatives? 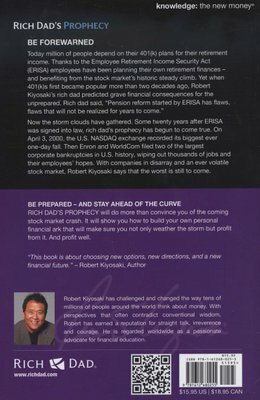 Robert Kiyosaki's rich dad foresaw these unfortunate events more than two decades ago. His prophecy was that these retirement programs would cause one of the biggest stock market crashes in history...a crash that is still coming. Rich Dad's Prophecy will show you how retirement financing will affect all of us, regardless of our age or where we live. Be prepared. This book will do more than convince you of the coming stock market crash. It will show you how to build your own personal financial ark that will make sure you not only weather the storm but profit from it. And profit well. 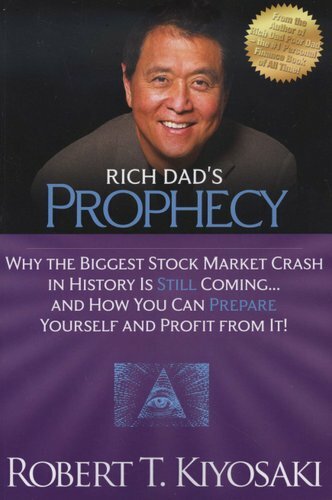 Rich Dad's Prophecy will teach you... * How the fears, dreams, and actions of millions of baby boomers will control the economic future * Why the old advice "Buy, hold, and diversify" can lead to financial disaster * How another stock market boom is on the horizon before the big bust-and when rich dad predicts it will happen * How to stay afloat amid the turbulent waters ahead-discover rich dad's favorite investments. "This is not a gloom and doom book. It is really a gloom and boom book. My rich dad would say such things as, 'Every time a law changes, the future changes.' For those who are vigilant and prepared for the changes coming, the future is very bright." -from the Introduction.